The One Book Interview is one-year old today. We’ve had fifty-two weeks of authors talking about their favourite books. To celebrate, we’ve got a fantastic interview from a big name in the world of dark fantasy. Author 52 writes. Vicious. Dark. Bloody. Viriconium by M John Harrison. ‘The aristocratic thugs of the High City whistle as they go about their factional games amongst the derelict observatories and abandoned fortifications at Lowth […] Next day some minor prince is discovered in the gutter with his throat cut, and all you are left with is the impression of secret wars, lethal patience, an intelligent maneuvering in the dark.’ It’s a fiercely literary, complex, many-layered series of stories about the city of Viriconium – the city, the fantasy city of which we all dream. It’s epic fantasy, and a critique of epic fantasy. It’s an exploration of writing and dreaming, of the memory of the past, of the grieving desire for another world. It’s a work of melancholy genius. War and Peace. I’ve read it twice, and got so much out of it both times. It has everything – the war scenes are fantastic, Tolstoy fought in the siege of Sebastopol and had seen warfare first hand; it’s a sweepingly romantic melodrama; it’s a delicate study of human life. I responded to the characters very differently on my first and second reading, and I suspect I’d see them afresh, think about them in new ways, understand them better and differently, with each reread. It’s certainly not a book one could easy exhaust. It’s also very long, which would be useful here. Philippa Gregory’s The Other Boleyn Girl. ‘I could hear a roll of muffled drums. But I could see nothing but the lacing on the bodice of the lady standing in front of me, blocking my view of the scaffold.’ I love historical novels, Mary Renault, Mary Stewart and Hilary Mantel are authors that I return to again and again; I read a lot of military historical fiction by authors like Christian Cameron. But I was rather, uh, dubious about Philippa Gregory. I was delighted, actually, she evokes the poisonous atmosphere of Henry VIII’s court very well, her Anne Boleyn is a tragic, horrifying figure. The Court of Broken Knives will always be the most precious thing I’ve written, because it’s the first book I wrote. There are still passages there that I read and think ‘Yes! That’s perfect! 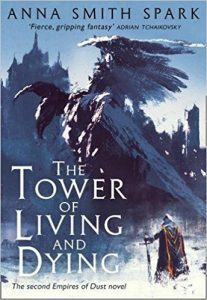 My god, I wrote that!’ But The Tower of Living and Dying is I think where I’ve completely found myself as a writer. ‘In the tall house in Toreth Harbour, the High Priestess Thalia lay awake in the darkness’. The Weirdstone of Brisingamen by Alan Garner. ‘At dawn one still October day in the long ago of the world, across the hill of Alderly, a farmer from Mobberley was riding to Macclesfield fair.’ A classic children’s fantasy, in which two children find themselves immersed in a world of elves, dwarves, wizards and evil powers that exists just out of ordinary vision within their own world of mid-20th century Cheshire. My father read it to me as a child. I’ve never stopped searching for the dwarves and elves and magic hiding in the English landscape. I’ve been out on the Yorkshire moors and the East Anglian salt marshes at night…. one day I’ll find the door in the hollow hills open, walk through. I’ve grown up with modernist poetry, I was writing poetry before I was writing prose fiction. There’s imagery from The Wasteland scattered throughout my own writing. Fragments, multiple voices, juxtaposition, the breakdown of narrative order, the search for the numinous in the mundane: modernist poetry has profoundly shaped my writing. The Court of Broken Knives .‘Knives. Knives everywhere. Coming down like rain.’ It’s the first book in the Empires of Dust series, sets out the world that I write and live the better half of my life in. I was discovering the world as I wrote it, the history and the geography of Irlast, its stories, its language emerged as I wrote the book. So that’s the obvious place to start. It starts simply enough, then the world slowly opens itself up. You can find Anna here. You can vote in the David Gemmell Awards here. 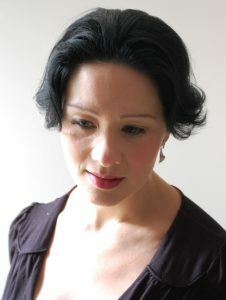 Anna Smith Spark is the author of the critically acclaimed Empires of Dust grimdark epic fantasy series. The Court of Broken Knives is out now with Harper Voyager (UK/world) and Orbit (US/Can); The Tower of Living and Dying will be published in summer 2018. Her favourite authors are Mary Renault, R Scott Bakker and M. John Harrison. Previous jobs include English teacher, petty bureaucrat and fetish model. You may know her by the heels of her shoes.